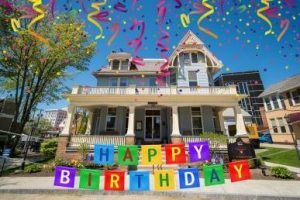 Join us for cake and snacks as we celebrate Kevin Garvey’s birthday with a housewarming party for The Russell J. Salvatore Hospitality House on the Kevin Guest House Campus. 1. Purchase gifts from our Amazon House Item Wish List. Bring gift to the party or collect them at home or your office and we can arrange to pick them up. 2. Learn about Norwex eco-friendly products and purchase on-line or come and see the live demonstration at the party by Norwex Representative Dawn at 5:30pm. She is donating 10% of every personal purchase to KGH. 3. Purchase Yard Sale items before or at the event. Furniture (desks, dressers, chairs and more), decorative pieces and household items that we are not able to use at our house, but that you would LOVE for your home. Your make a donation for these items will allow us to pay it forward for future guests.